Fudge present Structure Wax Shape and Structure; a re-workable, heavy duty wax that works to add definition and texture to your style. 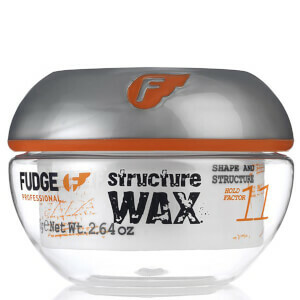 Delivering extra-strong hold without weight or sticky residue, the non-greasy wax allows you to effortlessly mould, sculpt and experiment to create professional results. Suitable for use on all hair types, you can expect ultimate body, enhanced shine and hair that stays in place all day long.